We know that the weapons of the deities in Indian iconography are the symbolic representation of the qualities of the deity. 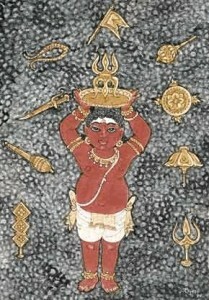 The two weapons that are particularly related with Kārtikeya and Indra are Vajra and śakti. But there is a small confusion between the forms of these two weapons. By hearing the word śakti, our mind points out śūla (trident) type of weapon and Vajra makes a shaft like form in our mind. But in the scriptures and in the images, the above assumption is seen completely different. 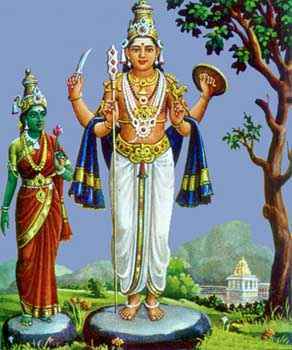 We can see the pictures of Subrahmaṇya where both of the weapons are found. But if we analyze the icon of Indra, we can come to an conclusion. The panel from Kailāsanātha temple at Kanchipuram, helps us to identify the vajrāyudha. 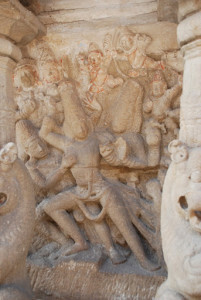 The panel depicts the birth of the demon Jalandhara. Indra visits Kailāsa where my Father was playing with the rudras with their form. Indra asked them, but by the provoking of the rudras, he tries to attack my Father who is in the form of Rudra without knowing the truth. Brahmā stops him by saying the truth. Here the hand of Indra has the weapon Vajra. Two tridents are mixed on two sides by which the Vajra is made. Hence we can identify the śakti which has three diamond shaped Paṭṭas. The śilpa text Aparājita Pṛccha, gives the clear definition of vajra. Hence it is clear that the Vajra is made up of two śūlas. 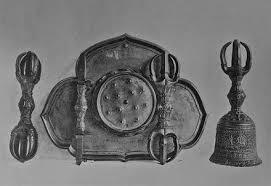 The Buddhist vajras and Vajra bells confirms this identification. It seems that the concept of śaktivel in Tamilnadu was conceived from the combination of śakti and Vel. Iconography Aparajita Pruccha, Ayudha, Indra, Kartikeya, Sakti, Vajra. permalink.